Known to her close fiends and family as The Poetry Lady, Denise Rodgers is a professional writer who has been reading and writing poetry since she was 14, when her older sister had the nerve to get married and leave her alone with hours and hours of quiet time to read and write. She is the author of “Great Lakes Rhythm & Rhyme,” a collection of whimsical poetry about the Great Lakes region, as well as “A Little Bit of Nonsense,” a collection of wacky poetry about animals, food, and odd ideas and people. Denise Rodgers signing copies of "Great Lakes Rhythm & rhyme" at the Great Lakes Booksellers Association event in Dearborn, Michigan. In addition to her own collections, her poetry has been featured in Jack Prelutsky’s “Read a Rhyme, Write a Rhyme,” (Alfred Knopf, Fall 2005), as well as in “The 20th-Century Children’s Poetry Treasury” (Alfred Knopf, 1999). Several of her "Great Lakes" poems have been included in the "MEAP" (Michigan Educational Assessment Programing) tests. Her poetry has also appeared in “Children’s Digest” and “Junior Trails” magazines. Ms. Rodgers lives in Huntington Woods, Michigan, with her husband Peter. She and her husband have two adult children. 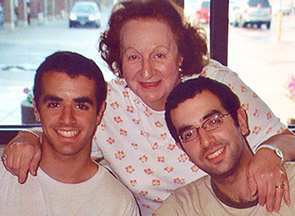 Denise's sons, David and Ted, being pampered by The Poetry Lady's mother.